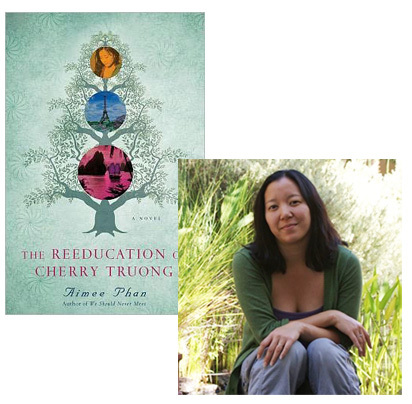 I’m looking forward to reading Aimee Phan’s first novel, The Reeducation of Cherry Truong. Earlier this year, I talked about recognizing the need to read outside my embedded biases, so that’s certainly a reason that Reeducation caught my eye, but it’s not simply a matter of filling out a bingo card of ethnicities. I’m also considering the genre Phan has chosen, the family epic, and though I haven’t had the opportunity to think this completely through yet, I’ve got a hunch there’s a lot somebody could say about the literary intersection of family and history and the ways in which such stories have been received based on the author’s gender. (When you read Phan’s essay, for example, you’ll notice that all the benchmark novels she mentions are by women.) And I’m also just looking forward to reading it because I’ve heard great things about it, and I’m always on the lookout for a good story! When people ask me what my novel is about, I sometimes feel like I need to apologize for the simple answer: “It’s about a family…a really big Vietnamese family…” I can imagine some readers’ eyes glazing over, already presuming to know what I’ve written, and I want to tell them that mine is different. That this immigrant family, of the many we’ve seen in contemporary ethnic literature, is also worth learning about. The epic family saga is a familiar narrative in the immigrant novel, and for many reasons, I should have avoided it. After all, writers of color, especially Asian Americans, have already covered and mastered this genre decades ago. Do we need another Joy Luck Club? Another Woman Warrior? Dogeaters? The Namesake? Instead of trying to poorly imitate a classic archetype, why not conquer new territory and demonstrate that Asian Americans can move beyond the immigrant family tale? And certainly many contemporary writers of color have done that. There are plenty of Asian American writers who have pushed outside the expected boundaries with excellent, innovative prose and poetic achievements. So why, when starting my first novel, was I inextricably drawn to writing about a multigenerational family? Because you cannot ignore what inspires you, what motivates you to write. For the last ten years, the narratives that have filled my head and heart, that have driven me to create and revise over and over again, have been the tales of two extended Vietnamese families, perhaps because these voices were the ones that inspired me to value storytelling in the first place. I remember as a child going to family reunions or Christmas celebrations, amazed at all the lives that fit into one house, how my grandparents, aunts and uncles all had tales of tragedies and triumph inside of them, and how they all related to the way my cousins and I were growing up in America. This is why the family saga feels so compelling, because even in our small interactions with our parents or siblings, we play a role in an ongoing, vast history that can feel both overwhelming and intimate. And for me, this history couldn’t be recounted by only one character such as Cherry, even if The Reeducation of Cherry Truong is ultimately about her journey and discoveries. Despite her determination to learn all her family’s secrets, my main character couldn’t and shouldn’t know everything. Other family members had to step in and fill the holes of the narrative that Cherry could never learn of or understand. Yet, it is a lot to ask readers to invest in a multitude of characters, to dive into the heads of so many perspectives. Readers often prefer following a single character throughout a larger novel—it tethers them through a winding plot, and provides an intimacy that perhaps a multiple perspective narrative cannot offer. Why risk confusing readers, if I could simply write the novel from a single point-of-view? Wouldn’t it be easier for everyone? Perhaps. But for me, the novel is much richer, more inclusive, in allowing other characters to speak for themselves, for readers to hear from voices other than our main protagonist. And even with these other characters (there are a total of six narrators), we realize there is still much more to these families’ lives that we will never know. I believe that is what makes the family saga so inspiring and… epic. It is the writer reaching as high and far as she can, knowing she cannot detail everything, but acknowledging that there is still more out there that we can learn.